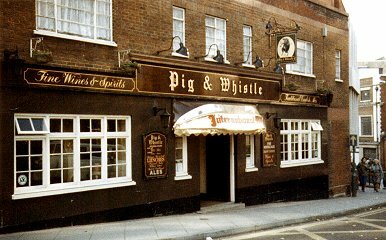 Back to PIG & WHISTLE March 2013. Single bar counter rough timbered bar counter cladding, plain supports to thatched roof type bar canopy. Artex walls and applied beams to ceiling. Refrectory tables, dralon upholstered settees some fitted around walls, others freestanding. All furnishings and fittings are modern.